Good news: Bicycle crunches are one of the most effective exercises for strengthening your ab muscles. Bad news: They aren't very helpful if your primary goal is weight loss. Bicycle crunches don't work off fat, even from your belly, because they burn very few calories. They can be part of a routine to create a toned midsection once you've dropped fat, but you're better off following a comprehensive fitness program that includes cardio and total-body strength training, along with a calorie-controlled, balanced diet to lose weight. Weight loss occurs when your body is in a caloric deficit, meaning you're burning more calories than you consume. When this deficit equals 500 to 1,000 calories per day, you'll lose one to two pounds per week. Create this deficit by eating less and moving more. However, you never want to eat fewer than 1,200 calories if you're a woman or 1,800 calories as a man, or you'll slow down your metabolism and make weight loss harder. On the flip side, exercise helps you create the deficit required to achieve your weight-loss goals, if it's a mode that burns notable calories. One of the areas where your body stores fat may be your abdomen, but exercises specific to that area don't melt that fat away. Fail to train other muscles, and you deprive yourself of a major weight-loss ally — your muscles. A progressive program that challenges every major muscle group with heavy weights two to three times per week helps you put on muscle to shed pounds. Moves such as squats, deadlifts, bench presses, rows and lunges work multiple muscle groups at once with an intensity that contributes to muscle growth. Aim for a minimum of one set of eight to 12 repetitions of each exercise, using a weight that's hard to lift by the last effort or two. A fitness professional can help you with optimal form and in devising a program that's right for your experience level. 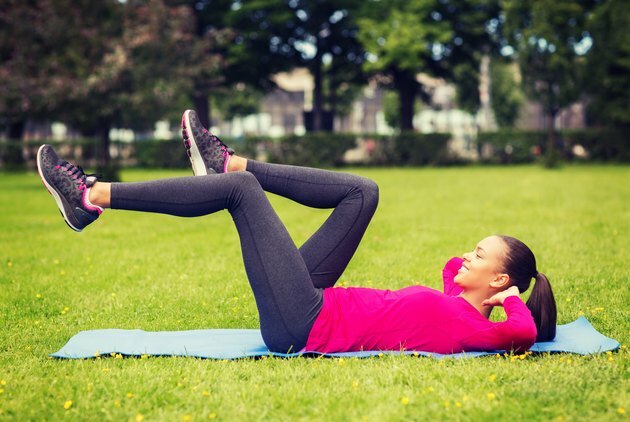 Bicycle crunches can be part of this strength-training routine. They strength the rectus abdominis — the front layer of abs — and obliques. Do the move in a slow, controlled manner with attention to lifting with your trunk, not tugging on your head with your hands. Make bicycle crunches one of several core movements you regularly include. Bird dogs, for example, help train the muscles of the low and mid back while planks target deep internal ab muscles to benefit your posture and stability. Strength training is just one piece of the weight-loss puzzle, though. Trim calories from what you eat daily by choosing mostly unprocessed foods, such as lean proteins, fresh produce and whole grains. Stick to moderate portion sizes, such as a palm-sized piece of meat, a 1/2 cup of brown rice and two cups of vegetables at meals. Accent most dishes with a teaspoon or two of healthy fats, such as olive oil, nuts and avocado. Avoid skipping meals to save calories, which can leave you ravenous and lacking in energy to complete workouts. 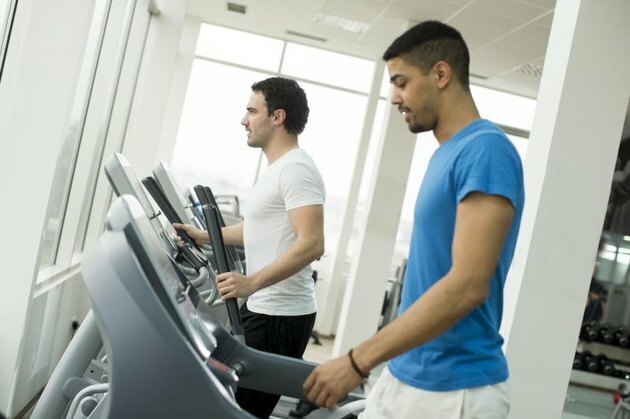 As for exercise, the American College of Sports Medicine recommends at least 250 minutes per week of moderate-intensity cardio to lose significant weight. Brisk walking and cycling at about 10 mph on a relatively flat road qualify. To reach the 250 minutes, aim for 45 minutes per day five to six times per week. Add variety — and potentially more weight-loss punch — to these workouts by adding intervals, during which you speed up to a hard effort for a minute or two followed by a minute or two of easier work. Begin every workout, whether it's strength-based or cardio, with a warm-up. Don't forget to cool down either to help reduce chance of injury and mitigate soreness. Just five to 10 minutes is all you need for each.